Posted February 16th, 2014 by Gerry La Rocca & filed under Advanced Accounting, Canadian Economy, Currency, International Business Operations. Each day, Lorne Lantz buys his lunch with bitcoin. Some say the burgeoning digital currency has no real value — but his sandwiches say otherwise. Bitcoins and other “cryptocurrency” have started to rise from the fringes of the internet to the cusp of mainstream use — a remarkable breakthrough for a currency which made its online debut only four years ago. When they first began moving online, bitcoins could buy you almost nothing. Now, there’s almost nothing they can’t buy. From songs to survival gear, cars to consumer goods, hard currency to hard drugs — retailers are rushing to adopt the virtual currency for all its perks. READ MORE: Why are Canadians buying Bitcoin? Advocates describe bitcoin as the foundation of an almost utopian economy: one with no borders, no change fees, no closing hours, and no one to dictate what you can and can’t do with your money. The currency’s detractors say bitcoin in and of itself has no value, that it just functionally meets certain payment and monetary needs, which has attracted investors who then give bitcoin real financial value through speculation. The Conservative government also singled out the seedier side of the currency in its 2014 federal budget this week, pledging to ensure it can’t be used to launder money or finance terrorism. 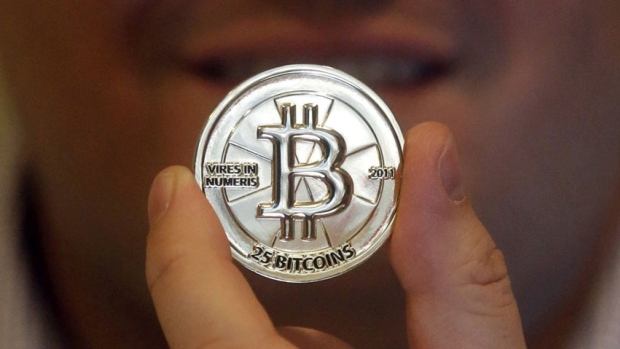 But early adopters in the Hamilton area say digital currency is just going to keep growing. Cryptocurrency is also extremely valuable in places like India and Africa, where the mistrust of banks and governments make people leery of intense oversight and favour carrying cash, Lantz says. Bitcoin’s mechanics were first outlined in a research paper by Satoshi Nakamoto — which is considered to likely be a pseudonym. The coins themselves made their online debut in 2009. Bitcoin is generated by thousands of so-called miners. These are people who, working individually or in groups called “mining pools,” use powerful computer components to run software that solves a series of mathematical puzzles. Each time the miner solves the puzzle, they receive bitcoins, which they can trade for currency or otherwise put into circulation. The tally, or “block chain” is one of the most important ways in which the system prevents fraud, and the miners are rewarded for supporting the system. 1. Check out “weusecoins.com” , now that you registered, what do you think about these bitcoins? 2. Why is the Bitcoin worth so much? 3. If you own any bitcoins, and know anyone who does: discuss with the class?